Do you have a project that requires effective traffic control to be in place to keep you and your team members safe while working? From start to finish RCS delivers the tools and personnel required including traffic control plans and city encroachment permits. Any work that is being performed near a public road requires specific safety procedures, alerts, a common sense approach, and a sense of responsibility. Both the person in charge – the owner or project manager – and the team members working are in charge of ensuring that everyone is kept safe while working in an environment where a large amount of traffic goes through. It’s not just a case of ensuring that workers are safe but also that the workers don’t pose a risk to the public who are driving on the roads. While traffic management tasks and temporary traffic control mean that the workers are not exposed to traffic for too long, there is still a risk during any work that is being done, which is why putting a traffic control plan in place is required and protects workers from road traffic and helps to control the traffic safety. The question is, of course, how can you go about doing that? There are multiple instances in which traffic control service may be required, usually, the reason for this control is to keep workers, drivers and pedestrians safe making it extremely important that you know when you do and don’t need this type of control system in place. Road traffic control is required when certain works are being undertaken on the roads, these include things like freeway construction, road repairs, as well as times when the road is blocked due to a car accident or severe weather conditions, all lane closures and encroachment require road traffic control. When it comes to creating a traffic construction environment, there are some basic rules that need to be followed. Whenever there is going to be a road layout change, having an advanced warning is essential. This is so that drivers are able to prepare to make any maneuvers required to safely navigate the amended area of road. In instances where the road changes are not choking the flow of traffic, a single sign is usually enough. However, in most situations on both single and double lane roads, as well as freeways, advanced notice signs should be placed on the road in the lead up to the hazard. In the transition area, this is where the road closure begins, and channeling devices can be used to slowly and safely close one lane and move all cars into the remaining lane. Usually, traffic cones are used to create a transition area for drivers. Buffer space is the area that is not the transition area or the work area, it’s a few meters of buffer space in case any vehicles come too far over. The idea behind this area is to ensure that it is safe for both workers, pedestrians and drivers and that accidents are unlikely to occur. Because many drivers go too fast through construction zones, it’s crucial that you give workers adequate space to ensure that they are able to work safely. The work area is the location where the equipment is situated and where workers carry out the work at hand. This is the area after the work zone, it the place where the work and roadworks come to an end. The termination area is an important area as it is where the traffic is safely released to be able to resume normally without any problems occurring or any danger to driver, pedestrian or worker safety. This is a crucial area as safety must always come first when it comes to traffic control, as accidents can be serious in this kinds of situations. Roadway Construction Service will help! At Roadway Construction Service, we are committed to safety, which is why we make it our core value. We understand that when it comes to scheduling traffic control in San Diego California, there is a lot to consider, which is where we come in. 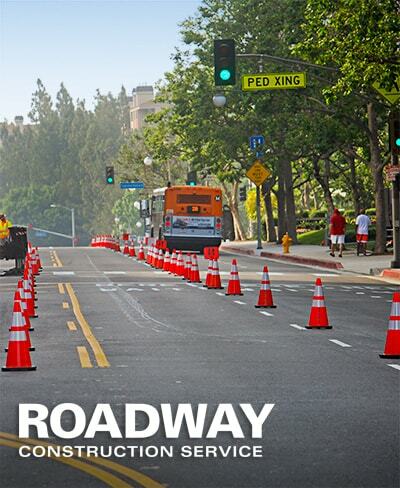 Offering three essential services for scheduling traffic control in Los Angeles County and the surrounding area, we are able to offer an all-in-one simple and affordable solution. We split the process into three simple areas and these are: traffic control, planning and permitting. Each of these areas is just as crucial as the others when it comes to dealing with traffic control, and it’s important to understand that. Even when it comes to dealing with temporary traffic control it’s essential that you ensure that you are taking traffic control equipment management seriously and doing everything by the book. At Roadway Construction Service, we offer a complete range of traffic control services, these include single, double, multiple, and freeway lane closures, two-way flagging operations, ramp closures, construction notice sign installation, in addition to concrete and water-filled k-rail installation. Going above and beyond, to ensure that your traffic control process runs smoothly, we can also monitor each of your closures to ensure that everything is set up as it should be and that each device is in the right position, is working well, and drivers are able to drive safely through the area. Our traffic management control can help to ensure that your road barricades, concrete jersey barriers and traffic cones are kept in place and adhered to by road users. If you would prefer to have a setup and leave option, that’s also something that we can help you with – we can work in whatever way works best for you. Whether you require simple lane closures, traffic flaggers or vehicle and pedestrian traffic control, we can help, regardless of the area that you are located in, whether it’s Orange County California, San Bernardino County and Kern County, our team is available 24/7 year round.